Hunter College's Brookdale Campus is home to the School of Nursing and the School of Health Professions. 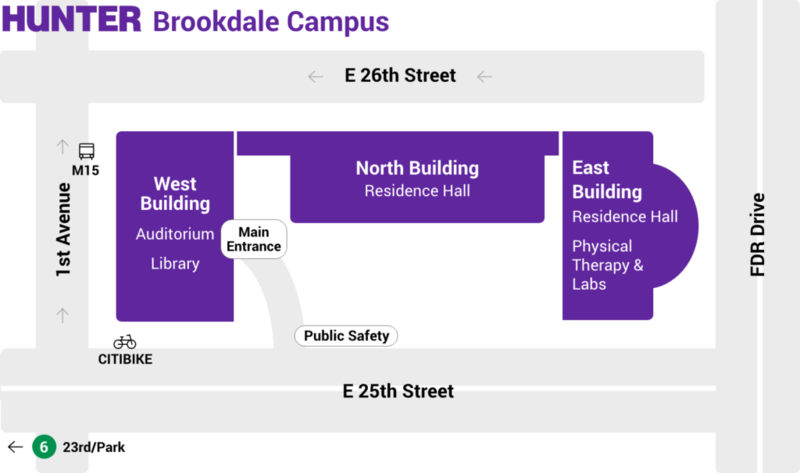 The entrance to the Brookdale Campus is located on East 25th Street, in the middle of the block (between the FDR Drive and First Avenue). Security Personnel at the building entrance can assist you in locating the office or person you're looking for. All visitors must bring a photo ID to enter the Brookdale campus building. West Building: Includes the main entrance, Auditorium on the first floor and Library on the second floor. North Building: Residence Hall connects the West and East buildings. East Building: Includes Residence Hall as well as Physical Therapy, Research and Science Labs. The 6 train stops at East 23rd Street and Park Avenue South. Exit the subway and walk four blocks east on 23rd Street to 1st Avenue. Alternatively, you can take the crosstown M23 bus east on 23rd Street to 1st Avenue. Then, walk north two blocks to East 25th Street and make a right. The entrance will be on your left. From the west: Take the M23 bus to East 23rd Street and 1st Avenue. Then walk two blocks north to East 25th Street on 1st Avenue. You can also take the M15 or M21 bus two blocks north. From the south: Take the M15 or M21 bus to East 25th Street. From the north: Take the M15 to East 25th Street and walk one block east. Take the Long Island Expressway to the Queens Midtown Tunnel. Make a left onto Lexington Avenue and proceed south to East 23rd Street. Make a left turn on East 23rd Street. Continue to 1st Avenue and turn left (north) to East 25th Street. Take the New York Thruway (I-87) to the Major Deegan Expressway. Continue to the 3rd Avenue Bridge, then to the FDR Drive, then to Exit #7 (23rd Street). Make the first right, which exits onto East 25th Street. The school will be on the north side of the street. Take the Lincoln Tunnel. Take 9th Avenue south to East 23rd Street. Turn left on East 23rd Street and drive across town to 1st Avenue. Turn left on 1st Avenue (north) to East 25th Street. Take the George Washington Bridge to the Harlem River Drive. Continue to the FDR Drive, then to Exit #7 (23rd Street). Make the first right, which exits onto East 25th Street. The school will be on the north side of the street.